HP 5000 has an extensive range of twin and single wall components with 25mm and 50mm cavity insulation, giving it the versatility required to meet the widest range of applications. It can be used internally and externally. 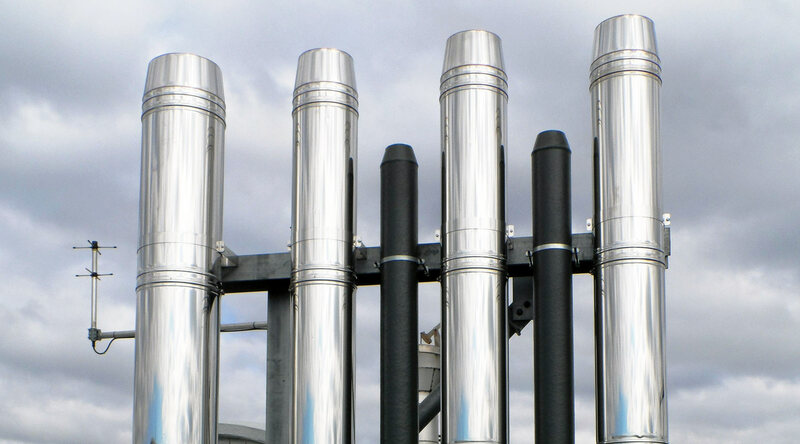 The multifunctional overpressure exhaust system HP 5000 made of stainless steel is the perfect solution when it comes to over- and/or under pressures of up to 5000 Pascal and high or low exhaust gas temperatures. The individual system components are available in single-walled or dou¬ble-walled construction. The system offers maximum stability and easy installation with force-fitted connections – resistant to vibrations of any kind. An engineered multi purpose prefabricated ducting system suitable for high or low temperatures and fire rated applications. HP 5000 is a lightweight twin wall insulated and single wall duct system specifically designed to handle both pressure and non-pressurised applications. 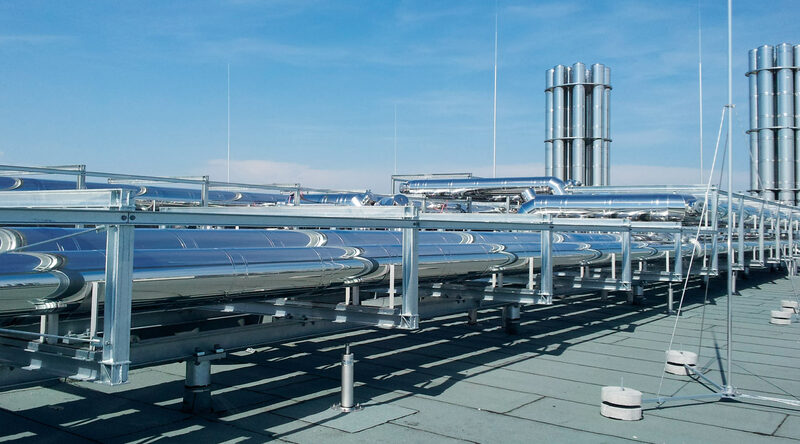 As outlined in the product’s CE designation, the system is designed to operate under pressure up to 5000Pa (European Standard Designation H1) and with continuous operating flue gas temperatures up to 600°C (European Standard Designation T600). The system is tested for Thermal Shock at 1000°C. 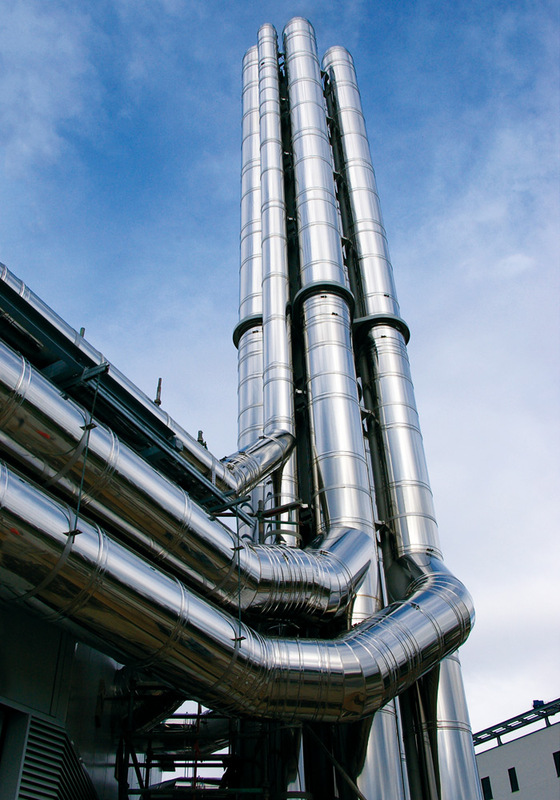 For industrial applications as an exhaust system for emergency power generators, thermal power stations and boilers. 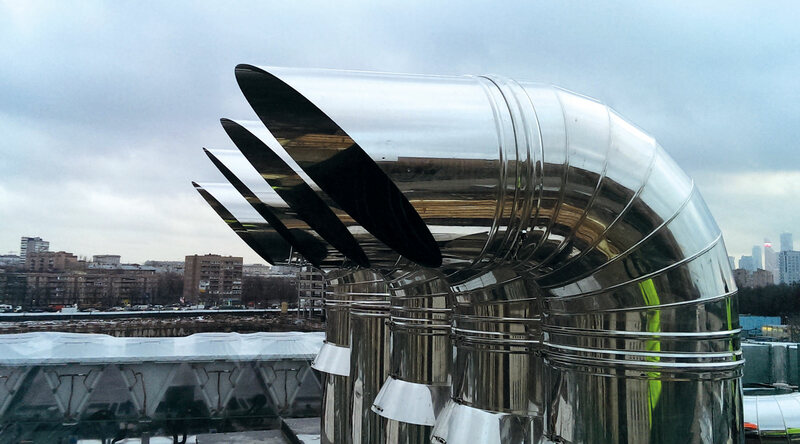 Suitable as a kitchen exhaust system as well as a protection for supply lines or as a mechanical smoke extraction system. Inner Liner 316L Stainless Steel; seam welded continuous construction with an engineered flange at each end. Available in 0.6mm and 1mm inner liner thickness. 25mm or 50mm cavity filled with a mineral fibre insulating blanket. Internal Diameters: 130 – 800mm. The 0.6mm option is available for diameters from 130 – 350mm..
(25mm and 50mm air cavity versions are available on request). Outer casing 304 stainless steel; 0.6mm for 130 to 550mm diameters and 0.7mm for 600 to 800mm diameters. The specially designed joint between the components creates a pressure resistant and structural liner. 316L Stainless Steel; seam welded continuous construction with an engineered flange at each end. Available in 0.6mm and 1mm. The 0.6mm option is available for diameters from 130 – 350mm. No sealants are required as the joints come with a pre-installed gasket. The components are flanged at both ends with a spigot at the male end. 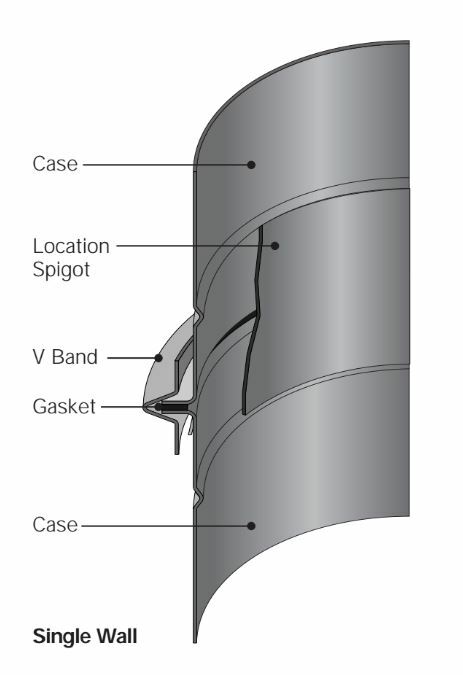 The spigot protrudes by 25mm to ensure correct alignment of the joint and seating of the gasket on the engineered flanges. A gasket is pre-installed on the male end of the component for ease of installation. 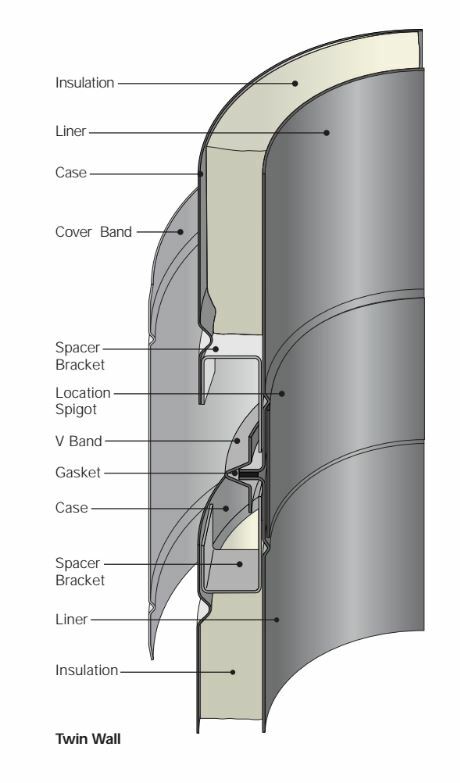 When two components are butted together the joint is secured using a V Band. 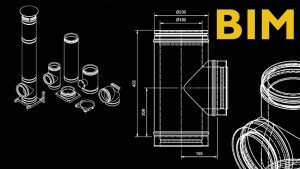 As the method of assembly for HP 5000 provides a continuous structural inner wall, normal expansion of the duct in its entirety must be allowed for by the use of expansion components. 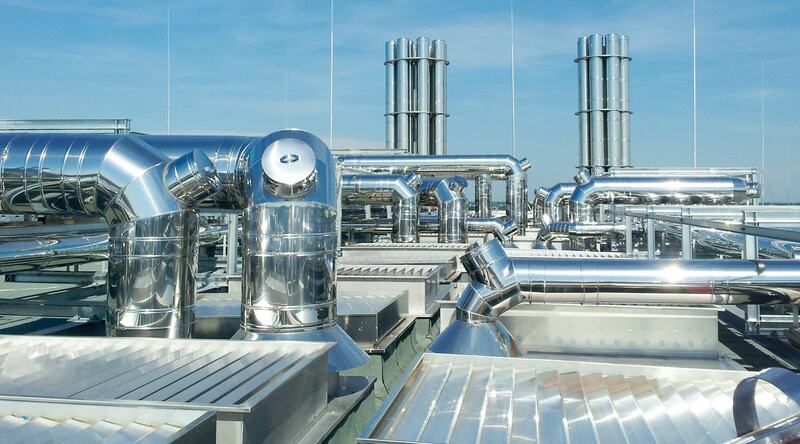 Maximum Temperature Rating: continuous 600°C (European Standard Designation T600). HP 5000 is available in a range of 18 internal diameters from 130mm to 800mm. The flange to flange installed straight lengths are 307, 470 and 960mm long. The external diameter is dependent on the width of the cavity – 25mm or 50mm. Specialised components can be manufactured to suit application requirements. 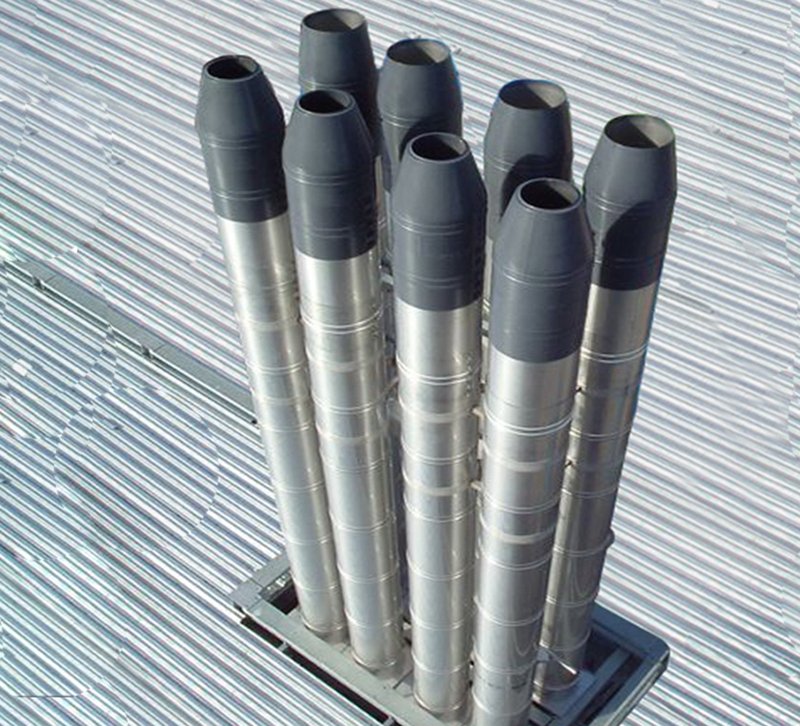 HP 5000 must be supported using only Schiedel Rite-Vent approved components, in conjunction with suitable steel work as necessary. Care is needed to ensure that supports are capable of accommodating expansion.